The 5.56 is the standard round used in the AR 15 rifle. Over the last few decades, the round has proved to be as effective as the platform itself. With that being said here is always room for change. The 5.56 is a great round for your first build, but once you go to that second, or even third AR it's time to change it up. The AR 15 is chambered in literally dozens of different rounds. There are so many different calibers and the AR 15 market is so massive it can support it. The three most available, and reliable AR 15 caliber alternatives are 9mm, 300 Blackout, and 7.62 x 39. These three calibers can be built on a standard multi-cal lower receiver. Tons of standard AR 15 parts can be used to complete builds in these calibers. A pistol caliber AR 15 has tons of advantages. The ammunition is affordable and incredibly common. There are many options for magazines, and most are affordable and common. A pistol caliber carbine can even be fired at almost all indoor ranges. They have very little recoil, concussion, and are quite quiet. Not hearing safe quiet, but you won’t blow your eardrums at an indoor range or if you use the weapon for home defense. Running a suppressor is easier because subsonic ammo is common and affordable. A 9mm AR falls into two different magazine patterns, Colt SMG pattern and Glock pattern. This refers to the type of magazine an AR can use. A Colt pattern magazine allows the use of a magazine block in a standard 5.56 magazine well. The 5.56 magazine well is much too large for a 9mm magazine. A magazine block locked into place allows you to convert the 5.56 mag well to 9mm. A Glock pattern receiver will have a proprietary receiver. This receiver can only use Glock magazines. Glock magazines are cheap and plentiful. Glock pistol owners can also swap magazines between a rifle and handgun. Building a 9mm AR 15 does require a special bolt carrier group, buffer and buffer spring. These parts are becoming more and more affordable since the growth of the pistol caliber carbine. If you decide to go with a 9mm AR 15 you do get a versatile, short range, and easy shooting rifle. The 7.62x39mm is the classic AK 47 round. It’s been used around the world in a variety of rifles, machine guns, and even a few bolt action rifles. The round is popular in the United States and is also affordable. Cheap Eastern European ammunition is plentiful and powerful. The 7.62 round is heavier than the 5.56 round, and at moderate ranges hits much harder than 5.56. The 7.62x39mm round is designed to be used at a max range of 300 yards. Inside 300 yards it absolutely dominates. The round has slightly more recoil than the 5.56 but it is still quite comfortable, and easy shooting. An AR chambered in this caliber does require a specialized magazine. These specialized magazines are curved much more than a standard 5.56 magazine. This curve is caused by the severe taper of the 7.62x39mm round. These magazines are quite easy to find online and average just a little more in cost than standard AR mags. These magazines will function fine with a standard AR 15 lower receiver. Some specialized AR 15 lower receivers can even use the more common AK 47 magazines. These lower receivers are specialized and can be quite expensive, but are an option for cheaper and more common magazines. AR 15s in 7.62 x 39 have a few advantages. They are more powerful than 5.56 and the ammunition is often cheaper. To properly function it's a good idea to invest in an extra strong hammer spring by a company like Wolff and a nice enhanced firing pin. The reason being is that some surplus military 7.62x39 have hard military primers and you need some extra strength to make sure they go bang. 300 Blackout has been making the rounds for a few years now. It hit the market hard and has gained a lot of momentum. The round itself is an overall genius idea for the AR 15. It’s ability for parts to interchange with standard 5.56 is where it really shines. The 300 Blackout can use standard AR 15 magazines, bolt carrier groups, buffer assembly, upper, lower, and trigger. The only difference between 5.56 and 300 Blackout rifles is the barrel and gas system. The 300 Blackout is a 30 caliber projectile placed into a shortened 5.56 case. 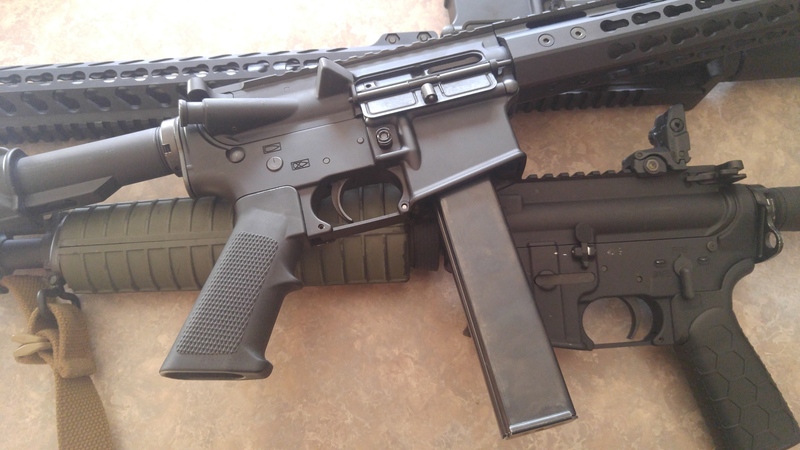 The overall length is the same so it interchanges with any 5.56 AR magazine. The projectile can range in weight, from 110 to 220 grains. The purpose being a light projectile is better for moderate ranges and is supersonic. The 220-grain projectile is subsonic and better suited for use in a suppressor. The subsonic round lacks the supersonic crack. The 300 Blackout round is also designed to be effective when fired from a short barreled rifle. In fact, it maximizes its velocity in a barrel as short as 9 inches. A 5.56 round out of a 9-inch barrel loses a massive amount of velocity and energy. This isn’t the case with the 300 Blackout. 300 Blackout ammo is the most expensive out of the three alternative calibers, but the price has been dropping. Different rounds in a similar platform have numerous advantageous. The main advantages are variety. Variety is the spice of life. Building rifles is a blast, and building the same rifle over and over gets boring. Adding a few extra calibers changes the way a rifle shoots and handles. It gives you a little something different to enjoy. Building rifles is addictive, so you might as well introduce something a little different when you can.